The hands that would soon be nailed to a cross now reached for a towel to serve those that would abandon him while he hung on that cross, alone! Jesus said that earlier to his disciples on the way to Jerusalem. Now, he is about to demonstrate it in the heart-rending moments he spends with his closest friends before his death. 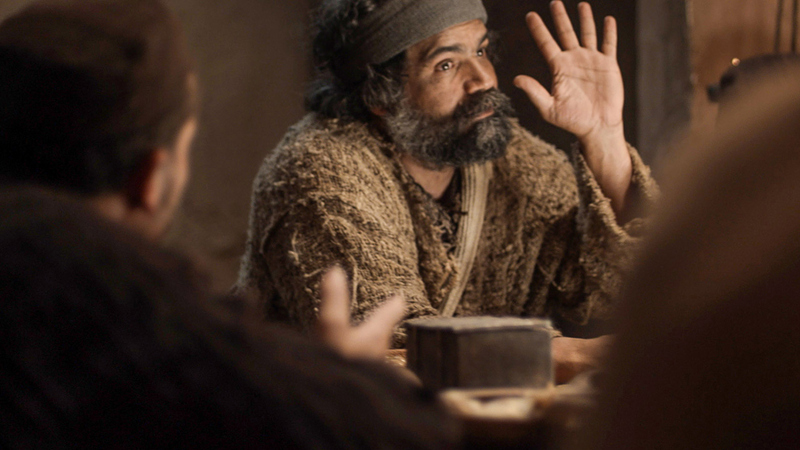 Jesus did not come to earth to be served, but to serve. One simple object, a towel, demonstrated that truth and etches it into our hearts. 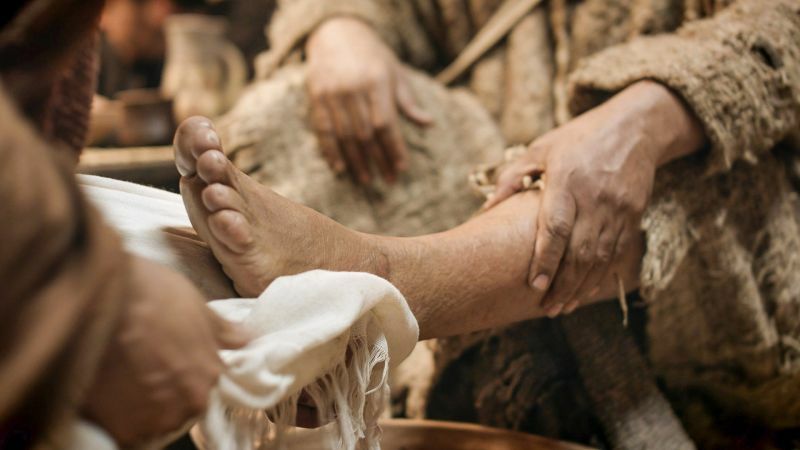 One menial act, washing his disciples’ feet, says so much about his love in this moment of absolute grace. The journey to Jerusalem had led Jesus to repeatedly warn his disciples that he would be rejected and reviled before being resurrected (Mark 8; 9; 10). His time had come, and glory now awaited him in Jerusalem. He would be lifted up — not on a throne but a cross. The Lord’s disciples, however, could only entertain one possibility of glory for Jesus. He would be the powerful leader who would restore the honor to Israel like King David. Jesus’ triumphal entry had only increased their anticipation of Jesus entering his glory. He would rule as the all-powerful king he deserved to be as the Son of David. They would not hear his warning about rejection, humiliation, and death. The Jesus they had come to know was too powerful for any force on earth or from hell to defeat him or hold him captive. He had cast out demons, fed hungry crowds, stilled storms, healed diseases, and raised the dead. Who could stop a Messiah like Jesus? The hands that held God's miraculous power were also connected to the heart of Jesus, The LORD's suffering servant, long ago proclaimed by the prophet Isaiah and now fully embodied in Jesus. The Lord had repeatedly refused to use his power to benefit himself. He had resisted the calls of his skeptics to prove his power and authority through some new miraculous display. Jesus, however, would not do miracles simply to show off to prove anything to his skeptics or to gain bigger crowds for his personal glory. Instead, the hands that would soon be nailed to a cross now reached for a towel to serve those that would abandon him while he hung on that cross, alone. Jesus had been sent into the world by the Father’s love. While in our world, he chose to minister, being motivated by that same love. He chose not to use his power to save his life. He would demonstrate a love stronger than hate, death, and hell by going to the cross. Even though his closest friends would not understand this before the cross, one simple item, a towel, would forever etch the Savior’s love for them in their mind. When they looked back on this night for years to come, they would remember that he got up from the meal, wrapped a towel around his waist, and did the work of a household slave to demonstrate his love for them. He was the one facing death. He was the one with absolute power. He was the one facing ridicule and abuse. He was the one worthy of honor, adoration, and praise. He knew the agony that was ahead of him. They were the clueless ones. He would be faithful to the end. They were the ones who would run away and hide in fear. He would display the Father’s love in the fullest way. They were the ones who would betray and deny him. He was hung on a cross in full view of the mocking crowds. They were the ones who would lock themselves away in this same room because they were confused, spineless, and weak. He was the one who would face the mobs, the madness of those who hated him. They would cower in fear and abandon him. When Jesus got up and wrapped the towel around his waist and began to wash their feet, he made clear one central truth: What he was about to do, what he was about to suffer, would not distract him from his mission nor dilute his love for that handful of people he had called to follow him. He would love them completely… to the end of his life… and beyond. He would worry more about them, not himself, as he approached his agony. For most of the evening, he would focus on their need, their uncertainty, their fear, their loss, their future, their faith… Only toward the end of the evening, in the garden, would he spend time with the Father focused on his needs. The towel around Jesus' waist forever symbolizes that night of selfless love and the cross that would soon follow. The towel around Jesus' waist forever symbolizes that night of selfless love and the cross that would soon follow. The towel spoke the truth of Jesus’ love for them, and for us. One simple item, a towel, reminds us of our Savior’s love for us! Before the Passover celebration, Jesus knew that his hour had come to leave this world and return to his Father. He had loved his disciples during his ministry on earth, and now he loved them to the very end. It was time for supper, and the devil had already prompted Judas, son of Simon Iscariot, to betray Jesus. Jesus knew that the Father had given him authority over everything and that he had come from God and would return to God. So he got up from the table, took off his robe, wrapped a towel around his waist, and poured water into a basin. 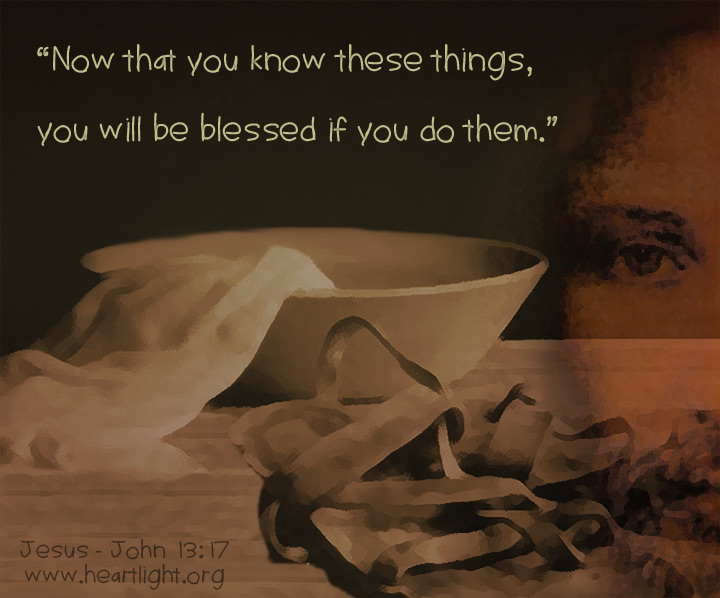 Then he began to wash the disciples’ feet, drying them with the towel he had around him (John 13:1-4 NLT). Why did Jesus choose the towel? Because in big ways — the cross — and in small ways — the towel — he came not to be served by us, but to serve us and give his life for us to ransom us from our selfish and short-sighted ways of living. No wonder we call him Lord, Savior, Redeemer, and Friend! Special thanks for the use of images related to Jesus' ministry from The Lumo Project and Free Bible Images for use on Phil's blog, "The Jesus Window"! "Seed, Towel, Promise, and Torchlight: The Towel" by Phil Ware is licensed under a Creative Commons License. Heartlight encourages you to share this material with others in church bulletins, personal emails, and other non-commercial uses. Please see our Usage Guidelines for more information.